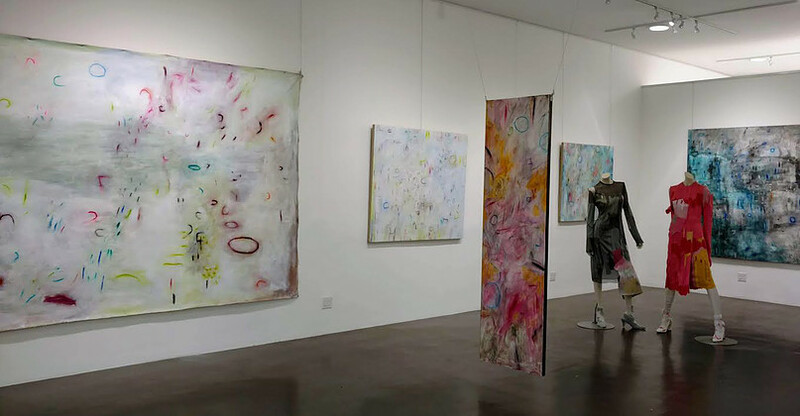 On Gray Avenue in Santa Barbara’s hectic Funk Zone is a quiet gallery where Eric Reel shares his abstract painterly language on canvas and paper. The largest is an un-stretched 7’ x 10’ canvas, “Origins.” It’s an opus hung like a papyrus fragment. Across the room are nine playfully framed pieces on mat board, titled “Tuning Field Study.” Each is 10” x 8,” grouped above a pristinely white upright piano. Ten frameless canvases explore variations on a theme—deeply valued markings on lightly colored grounds. In contrast, the work “Babel,” is mottled with dark grays and patches of blue. Layered with black, white and ultramarine symbols, “Babel” communicates in a language we don’t understand. While the conversation is intense, the selection of colors is harmonious, the symbols a discussion—not an argument. 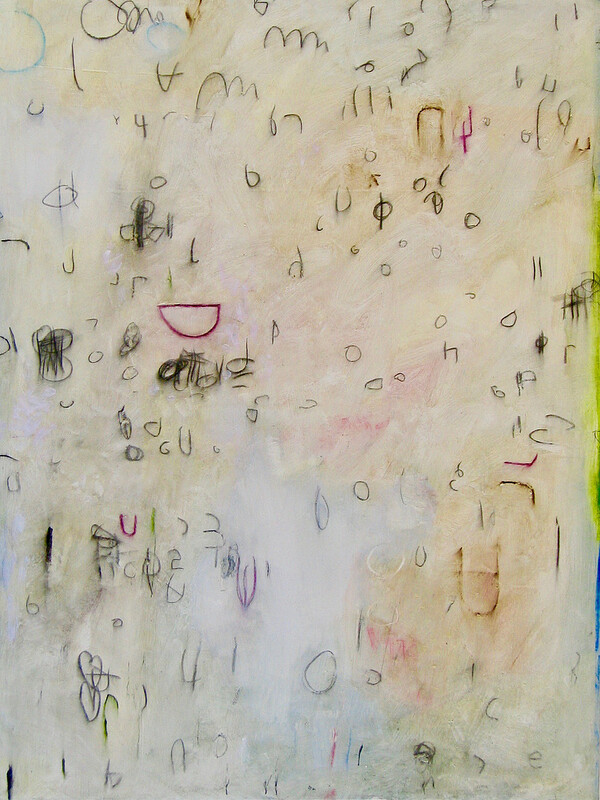 Reel’s lexicon of figure over ground relationships is exampled in the yellow hued “Return” and the scruffy white “2194.” Pastel hues similar to Richard Diebenkorn’s 1970’s “Ocean Park” series define the ground, or background atmosphere, over which lay water bug type pieces of complimentary colored, nonsensical text. These works are celebratory and elegant, revealing themselves slowly. The figures—isolated red, green and blue organic dots, staccato lines, distorted circles and fragments—appear listlessly static or in motion across the surface. Hanging from the white room’s ceiling, floating above the dark floor, is the sober double-sided totem, “Day/Night: Life/Death,” a reminder of our mortality. Perhaps, sharing Willem de Kooning’s coloration of “Woman 1,” Reel’s “Day/Night” deconstructs figuration into two sides of the same door. On one side, he depicts an almost jubilant abstraction of humanity; and on the other side, he portrays a stark concern that the next life is darker than the first. The exhibit “Erik Reel: Zero Point” is on view from Sept. 21 to Nov. 11 at GraySpace Gallery, 219 Gray Ave., Santa Barbara.